Debbie Dobrosky noticed a peculiar hue in the sky on August 6 — “a very ugly yellow casting” — as she peeked outside. A large cloud of smoke had begun to cover the sun. 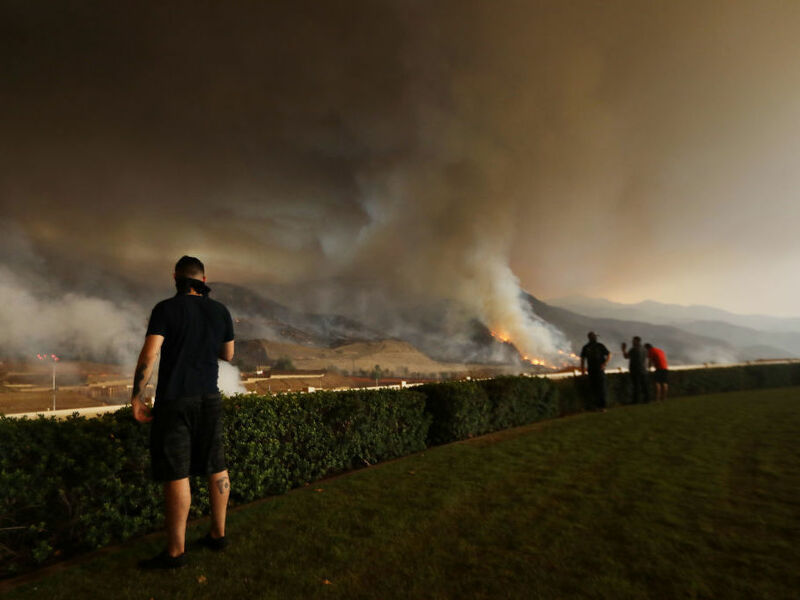 By the next day, the smoke was so heavy that “even inside my apartment I’ve had to use my inhaler twice this morning, which is not a normal thing,” says Dobrosky, a Riverside County, Calif., resident who lives about 30 miles from a fast-growing fire in the Cleveland National Forest. “Today I’m stuck inside, there’s no going out,” says Dobrosky, 67, who has chronic obstructive pulmonary disease (COPD), an inflammatory lung condition. At least 17 large fires are burning across California, and dozens more throughout other Western states, destroying hundreds of thousands of acres, sending toxic pollutants into the air and contaminating water supplies. The air quality in certain areas — particularly near California’s massive Mendocino Complex Fire in the northern part of the state — is among the worst officials have ever seen. With temperatures at times reaching into the triple digits, unpredictable winds and desiccated brush that serves as kindling, there’s no end in sight to this year’s fire season. “We are in a situation now where the wildfire season doesn’t really have its normal beginning or end,” says Lori Kobza, spokeswoman for the Sacramento Metropolitan Air Quality Management District. More than 749,770 acres have burned so far this year through early August. The Mendocino Complex Fire quickly overtook last year’s Thomas Fire as the largest in California history. And Shasta County’s Carr Fire generated a “fire tornado” with winds of 143 mph that ripped through the town of Redding. NASA satellite photos show towers of smoke in California billowing into the atmosphere and blanketing central California. Up and down the state, air quality officials have marked huge swaths as red with spots of purple — places where air is unhealthy or very unhealthy to breathe. Smoke and ash can travel dozens or even hundreds of miles. Air quality districts around California have issued warnings to stay indoors — with windows shut and the air conditioner running — and to limit outdoor activities. In many places, kids’ ball games, riding lessons and summer camps have been cancelled. Children, older people, pregnant women (especially their fetuses) and those with respiratory illnesses such as asthma and COPD are particularly at risk of smoke-related health problems. Fine particulate matter, which is mostly invisible, can lead to inflammation of the lungs. For people with cardiac problems, toxic smoke has been associated with an increased risk of heart attacks, strokes and death, says Dr. Michael Schivo, associate professor of medicine at University of California-Davis. Even otherwise healthy people may experience short-term breathing problems, eye irritation and coughing. Schivo, who has lived in the Sacramento area most of his life, says he can’t remember the air being as bad as in the past few years. More patients with chronic lung disease are experiencing more uncontrolled symptoms, he says. Lisa Suennen, 52, who lives in Marin County, about 100 miles from the Mendocino fire, has gone to the doctor three times in recent weeks because of lingering respiratory issues. She says her problem started as a cold, but as the air got worse, she developed bronchitis and her asthma flared up. Air quality experts and physicians say more fires are bound to occur, and people with health issues need to have a plan for the bad air days, such as keeping extra medications on hand. For people who do need to go outside in the smoke, air quality experts recommend wearing a specialized mask that protects from fine particulate matter. Cheap paper dust masks from the hardware store won’t cut it, says Kobza, of the local air district. An N95 respirator can filter out 95 percent of smoke particles, if it’s fitted properly and dirty air doesn’t leak around the sides, as NPR reported last year. Some people say they have no choice but to take the risk of going outdoors. Alyssa Mayo, 31, who has struggled with respiratory issues for two decades, runs a rehabilitation center for horses and dogs northeast of Sacramento. Now, she can’t see the mountain range out her window because of the smoke. Air quality may be the most pressing health issue caused by fires, but scientists say that ultimately water — another human necessity — is in danger, too. Ash, burned soil and toxic residue from incinerated houses, businesses and machinery can make their way into lakes, rivers and reservoirs, says Carmen Burton, a hydrologist with the U.S. Geological Survey’s California Water Science Center in San Diego. The extent of the contamination depends on factors such as topography and the number and type of materials burned. Wildfires typically sweep through rural areas more than urban — and this year follows that pattern, says Catherine Dunwoody, chief of the monitoring and laboratory division for California’s Air Resources Board. Some parts of California suffer more than others. The entire San Joaquin Valley faces the ill effects of blazes, not only in nearby Yosemite but throughout Northern California, says Anthony Presto, a spokesman for the San Joaquin Valley Air Pollution Control District. This region, he explains, is surrounded on three sides by mountain ranges, making it easier for pollutants and smoke to funnel southward and become trapped. Kimberly McCoy, who lives in Fresno, has seen that firsthand. She and her son both have asthma, and she says her chest feels tight and her son has been wheezing. McCoy says she hasn’t let her son outdoors in recent days. “That’s really hard for an active 6-year-old,” she says. Some people are wearing masks even in their cars. Dobrosky, of Riverside County, says she recently ordered a pack of specialized masks from Amazon after running out during last year’s blazes. After those fires, she also bought a treadmill so that she could exercise inside. Even so, Dobrosky says, her lungs are sore.